Keith Kingdon (left) won’t forgive brother Ken for bailing on the Pats during 2002’s Tuck Rule game. Remember the Super Bowl between the Patriots and Seahawks in 2015? Jeff Judge sure does. Not that he saw it all that well. For much of the game Judge stood in the cold outside his buddy Mark’s house, peering through window blinds and listening for boos and cheers from his friends for clues to the action. “I was freezing,” recalled the 26-year-old Judge. His crime? In January 2007 — yes, more than a decade ago, when he was just 14 — Judge innocently took a bathroom break during the AFC divisional playoff game between the Patriots and San Diego Chargers. And sometime between him leaving the TV room and flushing the toilet, the Patriots started a successful rally from an 8-point deficit and went on to win, 24-21. Fair or not, the group immediately held Judge responsible for holding the Pats back, branded him bad luck, and have since banished him whenever the Pats fall behind by more than a touchdown. Such is the life of a jinx. And there are a lot of them out there. Banned from entire playoff and Super Bowl parties or at least during crucial plays, at some point these unlucky people did something to get blamed for a Patriots loss and ended up pariahs. Maybe they stepped away when the team was winning and the mojo got reversed. Or they left when the team was losing and the mojo got reversed. Or they were cocky. Or had doubts, or wore the wrong shirt. Or the right shirt, but washed it before the game. Brothers. Friends. Beloved aunts. Grandfathers. With postseason success on the line, no relationship is sacred. When the Patriots face off against Kansas City Sunday night for the AFC Championship, Bill Belichick will be focused on slowing Chiefs quarterback Patrick Mahomes and preventing defensive end Chris Jones a nd linebackers Dee Ford and Justin Houston from sacking Tom Brady. And in Natick, Keith Kingdon is guarding against another threat: his brother Ken. “I will not allow him over for a big game any more,” said Keith, 51, a senior estimator for a general contracting company. Keith still gets worked up over the incident from nearly two decades ago that turned blood against blood. It was the playoff game against the Oakland Raiders in 2002, played in heavy snow and featuring the infamous play involving the Tuck Rule. The game ended with the astounding comeback that launched the Patriots dynasty. With about two minutes left, the Patriots trailing 13-10 and snow piling up outside, Ken Kingdon declared the game “over” and left Keith’s house to get home before the roads worsened. Whereupon what initially looked like a game-ending fumble by a not-yet superstar Tom Brady was instead ruled an incomplete pass. The rest is sports history: Pats 16, Oakland, 13. “He took his negative energy with him,” Keith said of Ken. For his part, Ken, executive producer at the Soundtrack Group in Boston, is understanding-ish about Keith’s superstition. “Back in the age of sail, sometimes sailors would blame bad luck or bad weather on someone in their crew,” Howe explained. That person would become known as a “Jonah,” from the biblical story of Jonah and the whale, in which Jonah tries to flee punishment by God on a ship. “But God sends them storms and all kinds of craziness, and so the guys on the ship chuck Jonah overboard,” said Howe, whose new novel, “The Daughters of Temperance Hobbs,” will be published this year. The rules of bad luck, and who it attaches to, seem fairly clear — at least in the twisted world of the superstitious. 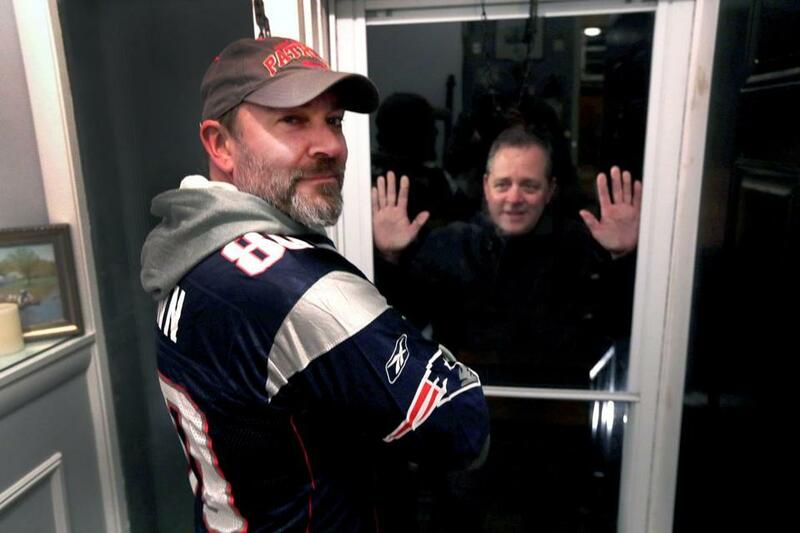 Even so, more than a decade after Super Bowl XLII, Mike Toomey, 44, a stay-at-home dad in Winchester, and Sophie Sweeney, a part-time recruiter from Arlington, are still arguing over who bears responsibility for the Patriots loss to the New York Giants. As host of the party that notorious night for Pats fans, Toomey logically might wear the curse — just as legions of Hillary supporters who hosted 2016 election parties feel personally associated with Clinton’s loss. But Toomey isn’t owning it. “It was 2007, the year they went undefeated UNTIL SOPHIE BROUGHT CHAMPAGNE TO THE SUPER BOWL!! !” Toomey told the Globe in an e-mail. Then there are those like Jeff Judge, the fan who watched the Seahawks game from outside his friend’s house, who seem resigned to being among the ostracized. Because of the storm hitting Sunday, Judge may end up staying home to watch the game. Some friends are even willing to come over — with the understanding that if the Pats fall behind Judge will leave the TV room immediately, even go out into the wintry mix if that’s what it takes to get the team to the Super Bowl. “When I watch, that’s when everything goes to crap,” he said.